If you're a fan of the game Carcassonne and if you've been waiting to introduce your children to this game, then you're in luck! 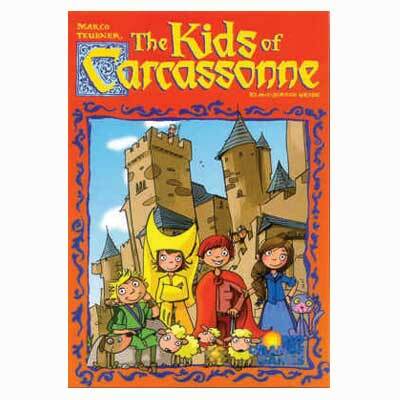 Rio Grande Games recently released The Kids of Carcassonne which is a simplified version of the adult game. The basic idea is still the same - you are building roads and paths. You take possession of certain areas. However, in this particular version or edition of the game, you are trying to capture animals that have been released in the town and return them to their pens by the end of the day. You do not keep score in this kids' version. Rather the first person to use all of their figures wins the game. As you might have gathered from yesterday's post, this game falls into Daddy Territory. He is the Chief Kids of Carcassonne Game Player in this household. I asked him what his impression of it was after playing it with our boys (aged almost 3 and a definite 5 years old) and he said that it was fantastic. He said that it was perfect for their age level, that our five year old could fully comprehend the rules of the game and plays it well. Our almost three year old enjoys playing it also (although his full comprehension might be called into question.) For our family this game is perfect to play with the children. It involves a bit of skill, a bit of thinking, and is just plain fun. While the packaging/cover art isn't likely to impress your average four year old, I would say that this is a more thoughtful and interesting game to play than you generally see about town. We're glad to own it. Daddy has spent the past month playing this with the boys off and on and it is enjoyed, every time, without fail. This one comes highly recommended. 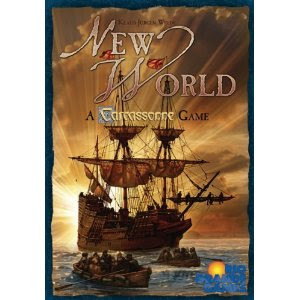 In the spirit of Carcassonne games, Rio Grande Games also released New World: A Carcassonne Game which is a variation on a theme. Instead of building roads and taking possession of land in medieval Europe, you are placing yourself in the New World (ta da! ), building towns, roads, etc. This is kind of a fun-themed game when studying Columbus and other explorers of the New World. Just a fun idea to toss into the mix. Thank you, Rio Grande Games, for allowing us the opportunity to check out some of your newer releases. It's been a great deal of fun for our family! I and never heard of this but it does sound fun. A little like the Catan games. I like thinking games much better than mere chance like Sorry. I've never heard of this game but it sounds like one my boys would enjoy. My oldest has really gotten into playing Civilization on the computer so I think he'd like a similar board game. I'll have to add it to the list of birthday possibilities for next year! THANK YOU so much for posting this!!! This is perfect for me to find out about. My husband and extended family *love* all those games-- Carcassonne, Catan, Puerto Rico, etc. We've been able to play Ticket to Ride with our 8 and 10 yr. old, but our 4 yr. old feels left out. AND my husband is just itching to teach them all Carcassonne. This game will now be under the tree on Christmas day to surprise my husband and that we can all play together. :) I just ordered it tonight! Thank you!!! Sidenote: In the same order, I also bought tonight a novel for kids called The Rise & Fall of Mount Majestic. You might find it interesting to check out! I didn't know there was a kids version! How cool. :D We have Carcassonne and New World; we enjoy them both. Good to know. We love Carcassonne. Will keep this in mind.